Masayang ibinalita ni Miss Universe 2015 na magkakaroon na siya ng wax figure sa sikat na museum sa Hong Kong. Tuloy-tuloy padin sa pagbibigay karangalan sa bansa si 2015 Miss Universe Pia Wurtzbach. My parents separated when I was 9 years old and by 11, I was the breadwinner for my family. I faced a lot of rejections – either due to my looks or that I was too tall to be paired with anyone. I tried many things including being a waitress, culinary arts and finally realized that my passion was in beauty pageants. I started with Binibining Pilipinas in 2013, my very first pageant, where among the 50 candidates I was the 1st runner up but I didn’t receive any crown. In 2014, I was just in the top 15 - I went home with nothing. This was tough to take in as there were also other younger participants but I did not give up. Every morning I would look in the mirror and say to myself that ‘I am Pia Alonzo Wurtzbach and I am Ms. Universe 2015’. This was my dream and I was going to get it irrespective of my age. During the pageant night, I did my own hair and make-up and also chose the color of my gown - blue. I may not be the most beautiful among all the candidates but I was fearless – I had the confidence that the judges saw and they chose me. What I have learned is that whatever you achieve is a result of your hard work – age is not a barrier. Confidence is something that you work on – it doesn’t come overnight. It did not happen to me overnight. It took me a long time to realize that I was beautiful because I was rejected, chosen by the judges as a runner up, chosen to be a loser and I eventually found that confidence to live my dream being fearless at any age. #FearlessAtAnyAge #Olay Watch the full video. Link in my bio. 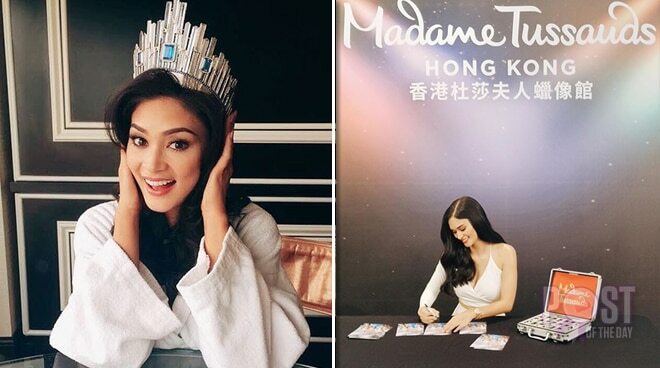 Sa kanyang bagong post sa Instagram, ibinahagi ng former Miss Universe ang kanyang kagalakan bilang unang Pinoy celebrity na nagkaroon ng wax figure sa Madame Tussauds sa Hong Kong. Sa post, naging pagbibiro pa ni Wurtzbach na tila isang magandang birthday gift para sa sarili ang wax figure sa Tusssauds. Ang Madame Tussauds ay isa sa dinarayong tourist attractions sa Hong Kong. Bukod kay Pia, ilang sikat na Hollywood celebrities din ang mayroong wax figure sa Tussauds.